The following graph shows the expenditure incurred in bringing a book, by a magazine producer. Study the graph and answer the questions given below. 1. What should be the central angle of the sector for the cost of the paper ? 3. If 5500 copies are published, miscellaneous expenditures amount to Rs. 1,848, find the cost price of 1 copy. Answer (d). 4% corresponds to Rs. 1,848, so 1% corresponds to Rs. 462 and 100% corresponds to 462 x 100 = Rs. 46,200. Cost of 5500 copies is Rs. 46,200, therefore cost of 1 copy is Rs. 8.40. 4. The cost of printing 100 copies was Rs. 10000/-, but the miscellaneous expenses just got doubled. What percentage of the total expenses are miscellaneous expenses? Answer (c). 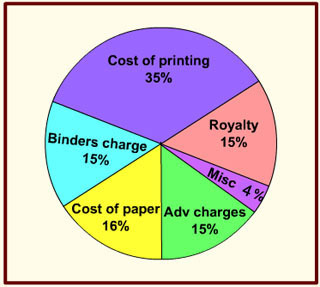 Miscellaneous expenses which are 4% amount to Rs. 400/-. Doubling of misc expenses means the misc expenses are now Rs. 800/- and the total expenses are Rs. 10,400/-. 800 of 10400 is 7.69% of total expenses. 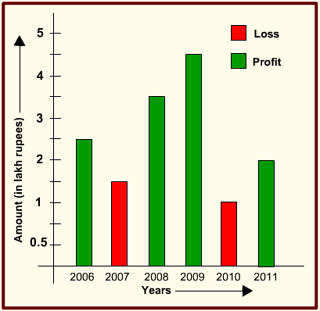 The following graph shows the Profits and Losses, (in thousand rupees) in a business for the years 2006-2011. Study the graph and answer the questions. 1. Which year exhibits the greatest change (positive or negative) in relation to the previous year? Answer (d). 2009 witnessed a profit of Rs. 4.5 lakhs while 2010 saw a loss of 1 lakh rupees. Answer (b). Total losses from 2006 to 2011 are 1.5 + 1.0 = 2.5 lakh rupees. Answer (c). Maximum profit = 4.5, minimum loss = 1.0. Therefore, the ratio is 45:10 or 9:2. Answer (c). Here loss = 2.5, profit = 12.5. Therefore the expression to be solved is 2.5 = x% of 12.5. x = 20. 5. What was the net loss or profit made by the company in 6 years? Answer (d). Total profit = 12.5 lakhs and total loss = 2.5 lakhs. 12.5 - 2.5 = 10 lakhs.